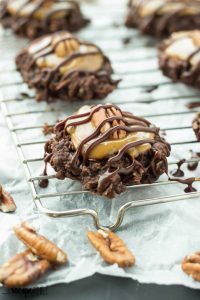 These No Bake Turtle Cookies start with chocolate oatmeal no bake cookies topped with thick caramel, pecans, and a drizzle of chocolate! Perfect for Christmas baking. Includes step by step recipe video. I love a good mash-up, you guys. I also love easy holiday treats that look like you spent a lot of time of them (because who actually has a lot of extra time around the holidays??). 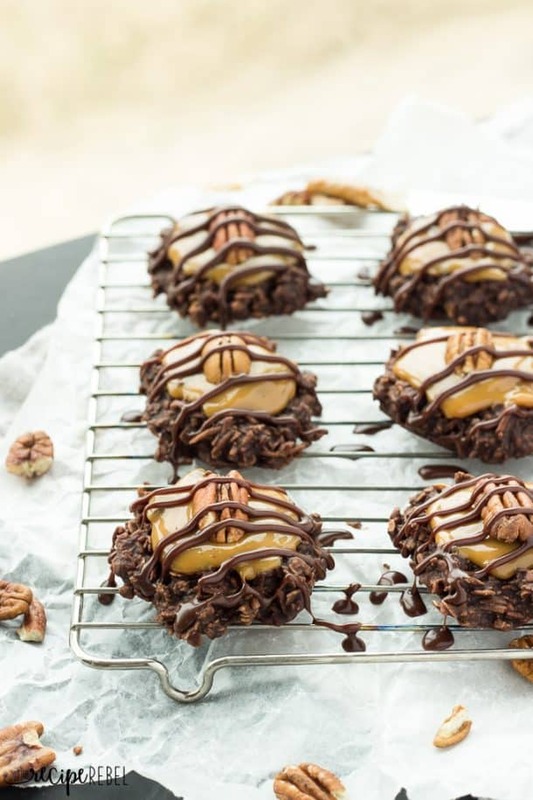 Enter these No Bake Turtle Cookies. I tell myself, “yes,” and then make it anyway. Now, there is nothing wrong with a simple chocolate no-bake cookie. No-bake chocolate oatmeal cookies are one of the best classic cookie recipes. But ever since the popularity of my Mint Chocolate No Bake Cookies, I’ve been dreaming up other ways to get creative with them. This one was a no-brainer. Turtle cookies?? Obviously! They are crunchy, chewy, chocolatey-caramel perfection. And they are way too easy for their own good! And since I know how much you all love Turtle everything (like Turtle Pumpkin Pie, Turtle Pudding Pies, or Peanut Butter Turtle Thumbprint Cookies), I knew you wouldn’t opposed. It’s important for the recipe that you use a dulce de leche or very, very thick caramel (like the super easy recipe included!). If you use a caramel sauce, it will slide off and be very messy! One thing we’re not into here is fork-and-knife cookies. When you’re forming the cookies, you ideally want them pretty flat so that it’s easy to spread with caramel and the pecan won’t slide off the top. If you have time to make a slight indentation before the cookies firm up, that’s not a bad idea either! I made sure the cookie base set up nice and firm so that it wouldn’t be a complete mess in your hands. I used quick oats, just because that’s what I had, but I don’t think using large oats would change much except that you will have even more texture in your cookies. Remove the label from one or more cans of sweetened condensed milk and place in a pot and cover with water. Bring to a boil and simmer for 3 hours, making sure the can is completely covered with water the entire time. Remove from the water and let cool completely before using. You can make as many as you want and store the unopened cans in the cupboard until ready to use! It’s a great thing to make ahead and will give you a nice, thick caramel as pictured. In a large pot, combine butter, sugar, cocoa, milk, salt and vanilla. Place over medium-high heat and bring to a boil, whisking often. Boil 1 minute, and then add oats and coconut to the pot and stir until combined. Drop by tablespoon onto prepared baking sheets and flatten the tops slightly. Allow to cool and set (you can speed this up in the refrigerator or freezer). 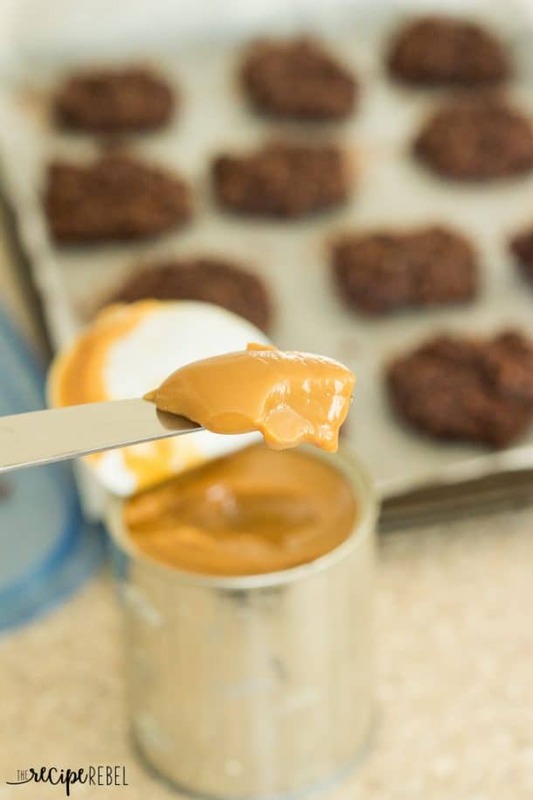 Once set, spread each cookie with a spoonful of dulce de leche and top with a pecan half. Melt together chopped chocolate and milk and stir until smooth. Drizzle over cookies and allow to set at room temperature or in the refrigerator. Store cookies in the refrigerator or freezer. Be very careful boiling condensed milk. Don’t use the cans with quick peel lids they may explode while cooking. Why can’t I print a recipe for the dulce de leche? I’ve never made before & step by step instructions would help me. Do I use one or two cans of the sweetened condensed milk? You will only need one can for the recipe, but you can make extra cans and keep them in the cupboard and the last for a long time! Would it work if I wanted to reduce the sugar amount to 1 cup? For this recipe I wouldn’t alter the sugar amount too much as it helps the cookies to stay together. These sound amazing! Think you could use non-diary products and still turn out? Like Ghee and almond milk? 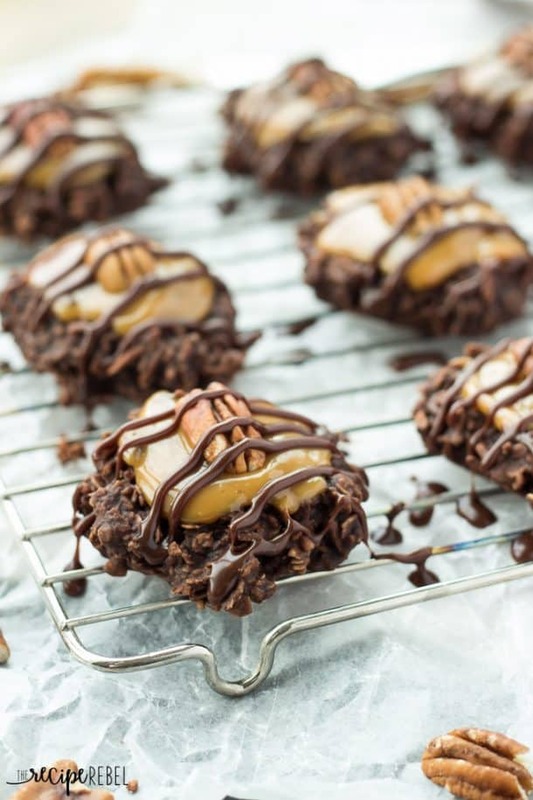 Absolutely love your creative idea with no bake turtle cookies! Never seen something like this! Definitely i will try to make it too! Thx for sharing Ashley! 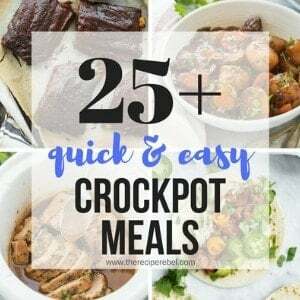 I actually haven’t made it in the slow cooker, but I think there are probably good instructions somewhere! Does the condensed milk turn to caramel after it is just boiling in water for 3 hours? I learned something new, dulce le leche and how to make it (yummy). I made theses cookies and they are too gooey to eat at room temperature. They pretty much have to come out of the freezer in order to eat them. Is this normal? What did I do wrong? Hi Janice! Mine definitely weren’t like that but I will have to test them again to make sure the measurements were correct. I’m sorry about the inconvenience! Hi Janice — I wanted to address this again. I tested the recipe again and found that it did need more coconut and oats. Thank you so much for the heads up and sorry about the confusion! I’ve updated the recipe above to reflect the changes. I would love to try to make these for my family and myself. However, I am deathly allergic to coconut. Is there anything else I can replace the coconut with? You should be able to replace it with an equal amount of oats, but I’ve never tried it. Let me know if that works! Wondering how they turned out replacing the coconut with oats. My family is not a fan of coconut but I think they would LOVE these otherwise! Ok, first of all, I have found a new friend! I love to cook, and exactly like you I do not want the same old tired food! I have never made them, so I am teaching myself how to make no-bake cookies. I don’t want regular no bake cookies, I want the ULTIMATE ones. This is what led me to your page. 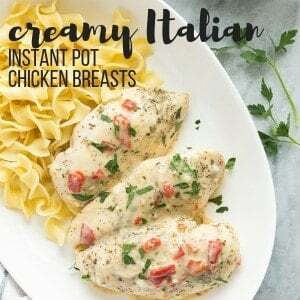 I’m inventing my own recipe, and your ideas are incredible! It didn’t stop there. I see Recipe Rebel and go, “Heh, rebel eh? Let’s see about this.” WOW! YES! A woman after my own heart – from the father’s day breakfast nachos to chili cheese lasagna – this is my style. You have carrots with bacon cream sauce?! I’m Jewish and wanting to go hunt down some Turkey bacon for this! Thank you for the breath of fresh air! Hi Ashley! Just finished the last cookies – they are SO good! Had some dulce de leche left so I made brownies. Threw in chocolate chips and walnuts. Dolloped the caramel on top and swirled it through. They are in the oven as I type! You have so many creative ideas – it’s nice to”converse” with you! Thanks Dorothy! I love your ideas too! Yum! Definately not too much! I am loving that these are a no bake and that Dulce de Leche sauce looks amazing. I could drink it! Mmmm. Need to make these asap! 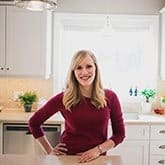 Great recipe Ashley! Thanks Dorothy! I’m so glad to hear that you liked them! They are a little decadent, but I’m all for a little indulgence every now and then! Yes is always the answer to everything chocolate and caramel. Always. 🙂 These look amazing, Ashley! These cookies look so good and I can’t believe they are no bake. Perfect for summer! These turtle cookies are SO not too much! they are brilliant!!! and that dulce de leche is everything! Way to dress up chocolate no bake cookies! This looks decadent and delish! I love “turtle” anything! Pinned! Oh my word! Talk about the best cookies EVER! And that caramel.. I really need to try making that dulce at home!! I love that you made no-bake turtle cookies! They look absolutely perfect, Ashley! 🙂 Dulce de leche is my weakness! These cookies look so delicious! Pinning! Haha, too much cake is an okay problem to have! 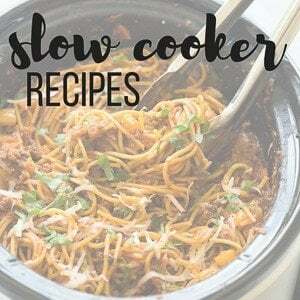 I have seen the slow cooker instructions but I’ve never actually tried it — I’ll definitely have to next time! I can’t believe these cookies are no-bake! Love that!! They looks fabulous! Turtle cookies are definitely a no-brainer, especially when it’s the summer! That caramel sauce is just calling my name. These look perfect, Ashley!